Hey everyone, I am looking to help a friend expand his PC out to be able to support dual monitors. So I am looking for some GPU recommendations. Usage: Internet Browsing, Forums, Watching Videos, Fusion 360, Photo Editing (No Gaming). Ideally looking for something that is sub-£100 and really ideal if it is passive cooled to keep it quiet. 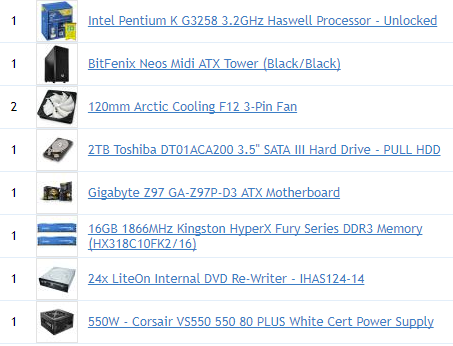 idk if it is too late to change the build? as from what i was reading that platform will never receive a fix for the spectre/meltdown bug/vulnerability but also as some cpu/motherboard combo will output dual screens without the need for an add in card. We made this PC nearly 2 years ago now. Just looking for a way to expand the monitors now. Even onboard graphics should support 2 screens? I think i'm using the HDMI and DVI output of one of my office PC's. Can't say i have noticed to be honest. It's only used for processing orders so no complaints. then, as wonder said, any add in gpu will really fit your needs. you might find it works out best if you use the card for both screens as running 1 off the gpu and the other from the igp can cause issues.